Two convenient tourist information centers, one just off I-95 Exit 90, the other in the center of Mystic at the train station. mysticinfocenter@yahoo.com) in Olde Mistick Village, the colonial-style shopping complex just south of I-95 on CT Route 27. 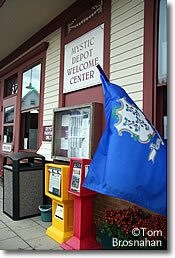 The Mystic Chamber of Commerce (tel 860-572-5098) operates the Mystic Depot Welcome Center in the Mystic Depot (train station) about a half mile east of the bascule bridge and the center of Mystic. in the train station at Mystic CT.